You’re probably wondering what the heck the title of this post means. Well, it’s the name of a summer drink and it was actually “invented” over the weekend at a friend’s house. The weather was hot and we wanted something to cool down with. My friends decided to make watermelon slushies. That’s when I suggested we throw some fresh mint in there, too. So, I give you not a mojito but a virgin wajito! Throw everything together in your blender, blend, and enjoy! 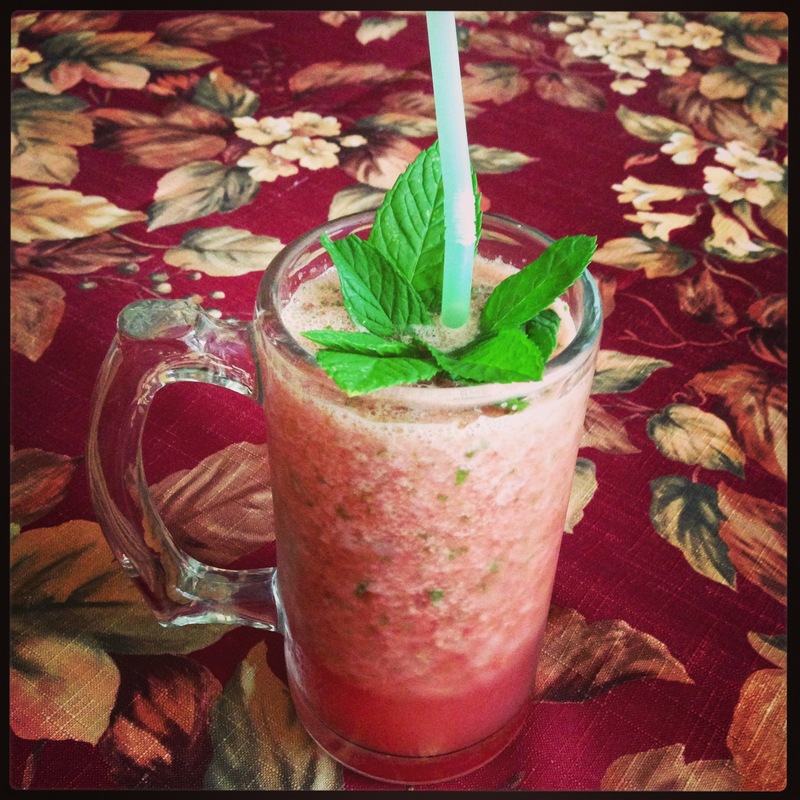 Garnish with some fresh mint on top. Simple enough and very refreshing! 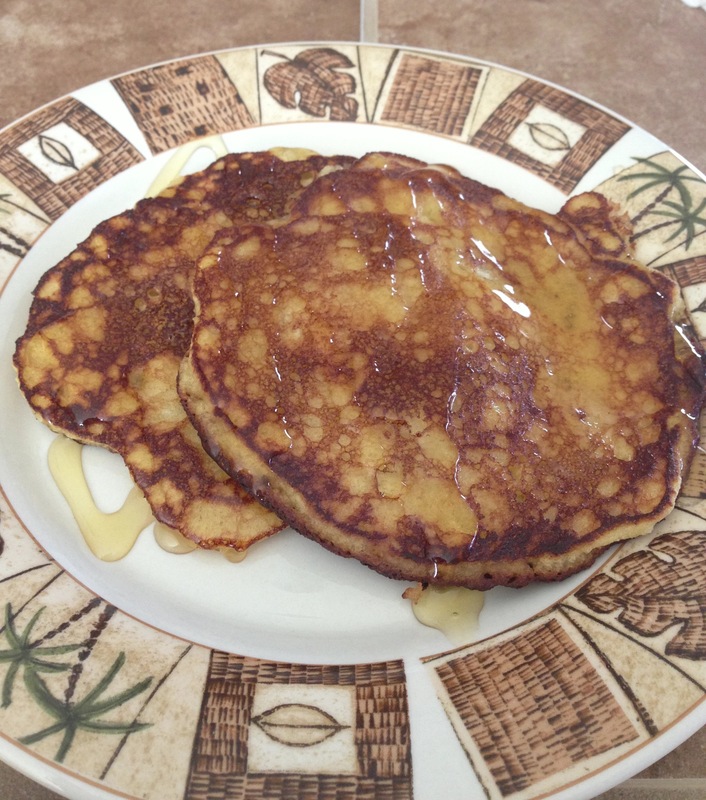 This recipe is a play on my original almond flour pancakes recipe I posted a few months ago. Since coconut flour gives everything a subtle and deliciously sweet taste, I decided to experiment with it. These pancakes turned out fluffy, moist, and so good; I loved the little chunks of coconut inside the pancakes as I ate each bite. I doubled some parts of my original recipe. This recipe makes about 6 pancakes. Mix the ingredients together (except for the coconut oil.) Heat your nonstick pan up with your coconut oil. Pour the pancake batter by 1/4 cupfuls onto your pan. Cook for about a minute to a minute and a half on each side (turning when the edges are dry and bubbles form on the surface of the pancake.) After removing from the pan, layer a piece of butter in between each pancake. Drizzle honey on top and enjoy! We’ve all been guilty of buying bananas, with the best intentions of eating them, only to see them ripening away on the counter, untouched. Instead of throwing them into a smoothie or frantically searching your cupboards for ingredients to bake them into something, why not fry them into a delicious treat? The best part of this recipe is that you need only a few ingredients, which you most likely have lying around the kitchen. Heat a nonstick pan with the coconut oil. Wait a minute and allow it to heat up. Take your banana, cut it in half, and then cut it lengthwise down the middle, so that you have four pieces of banana. Lay each piece in the pan on the coconut oil. Fry on medium heat for 2 minutes on each side. flipping with a spatula. 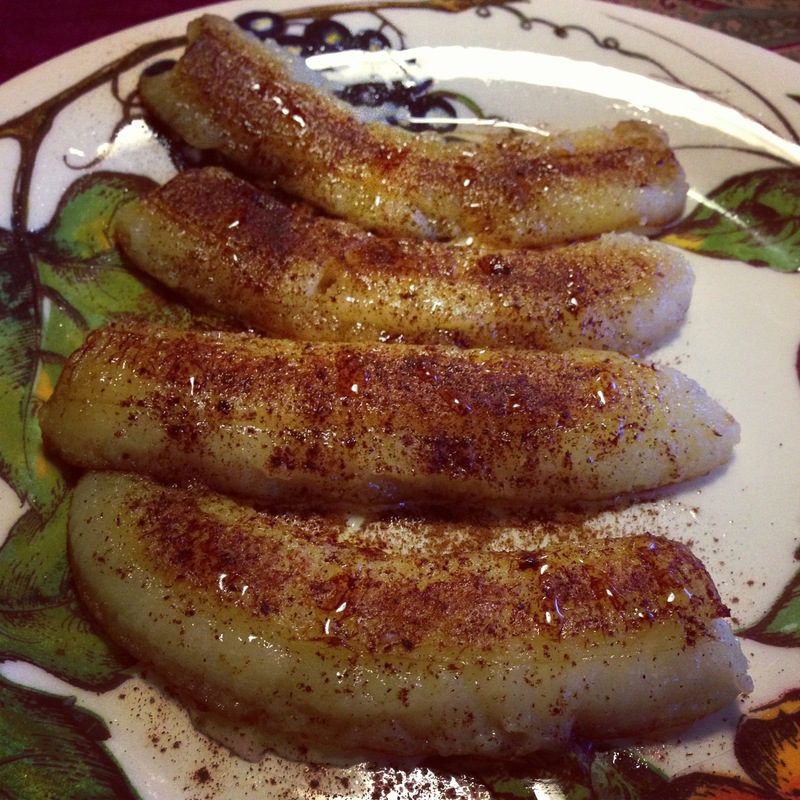 Remove your banana from the pan and transfer onto a plate. Sprinkle with cinnamon and drizzle lightly with honey. This is great as a snack (especially for pre and post-workouts), for dessert, or even for breakfast! 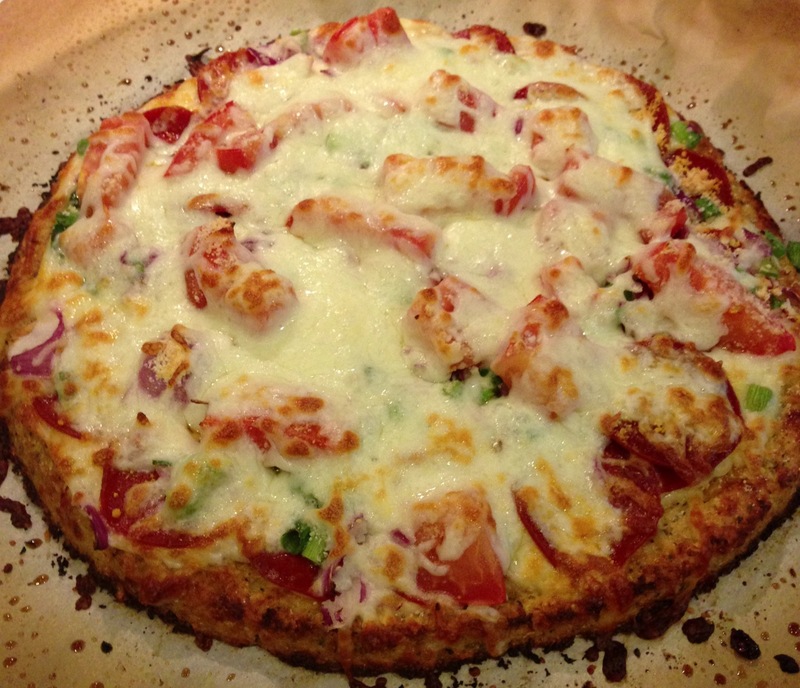 It’s simple to make, tastes delicious, and is healthy. And, you’ll be sparing your bananas from being thrown away, too! 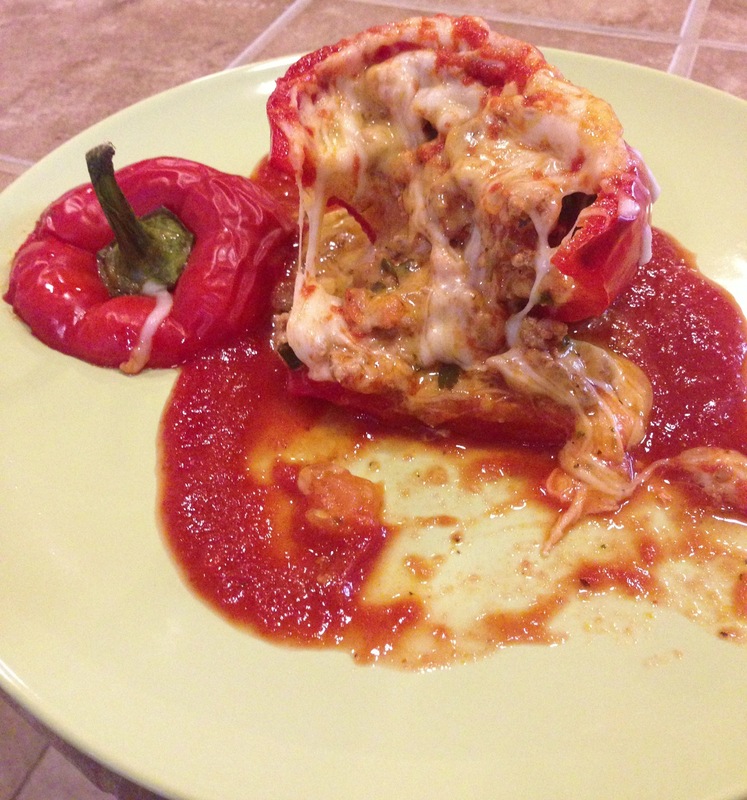 A few months ago, I posted a stuffed bell peppers recipe that wasn’t SCD legal. Now that I’m on the SCD, I’d been wanting to modify that recipe. This afternoon, I did just that, and let me tell you, the stuffed bell peppers I made today taste 100 times better than my original recipe! Just like my original recipe indicates, you’ll want to wash your bell peppers, cut the tops off, and remove the seeds and membranes. This time, I also kept the stems, instead of discarding them like last time. Place them in a pot of salted, boiling water. Boil for 7 minutes. When it’s time to remove them from heat and rinse them in a colander, the skins of your bell peppers should look shriveled up. This is what you want! Last time I made my stuffed bell peppers, the skins hadn’t wrinkled, yet, so the bell peppers were a little crunchy, even after being in the oven for so long. Put your bell peppers aside to cool a bit and let’s move on to preparing the stuffing. In a large nonstick pan, cook your ground turkey. Drain the fat in a bowl once the turkey has browned. Add a tablespoon of olive oil and saute your onions until they become translucent. Add the garlic, basil, oregano, Italian seasoning, tomatoes, cilantro, salt, and pepper. Add 2 cups of the tomato juice and stir your stuffing, so that it mixes well and the flavors distribute evenly. Spray the bottom of a 13 x 9 Pyrex with cooking spray. Cover the entire bottom of the Pyrex with the remaining 1 cup of tomato juice. Grab each bell pepper, sprinkle the inside with sea salt, and stuff the bottom with a small amount of Jack and cheddar cheese. Add your stuffing so that it fills up half of your bell pepper, sprinkle with cheddar cheese, and fill the rest of your bell pepper up with more stuffing. 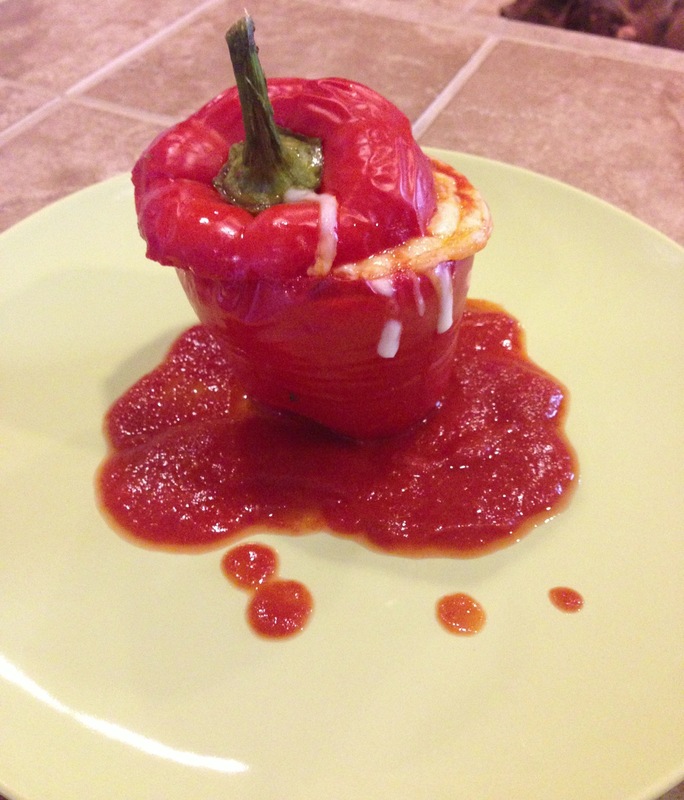 Place your bell peppers on the tomato juice in the Pyrex. 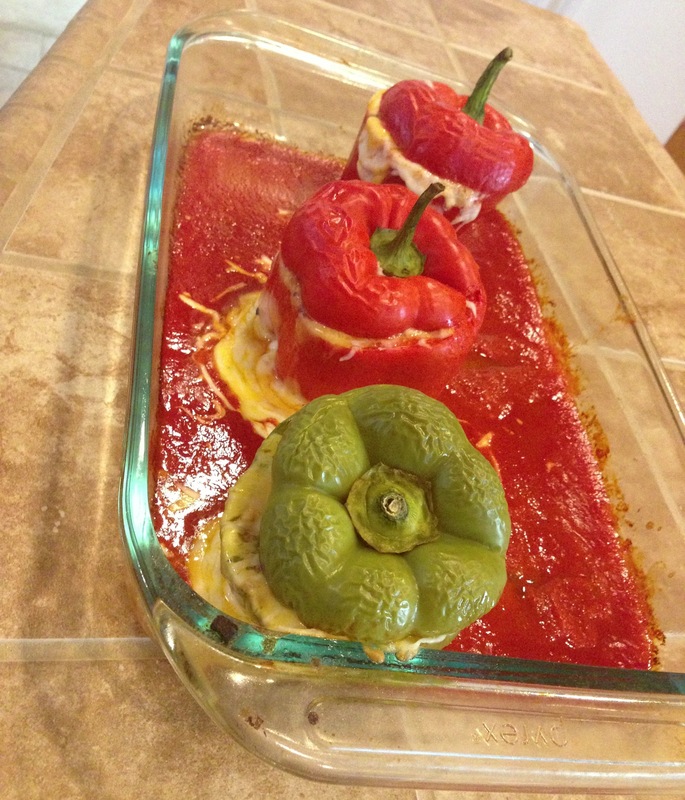 Put your bell peppers inside a 350 degree heated oven with their lids on top. Cook for 25 minutes. After 25 minutes, remove your bell peppers, take off their stems, and sprinkle your bell peppers with a mix of Jack and cheddar cheese. Place the stems inside the Pyrex but not on the bell peppers. Cook for 8 minutes, until your cheese nicely melts and browns. I threw one green bell pepper in there for aesthetic purposes but generally speaking, red bell peppers are so much sweeter than their green counterparts and add so much more juicy flavor. Although my modified stuffed bell peppers recipe today had way fewer ingredients than my original stuffed bell peppers recipe, it tasted a whole lot better! 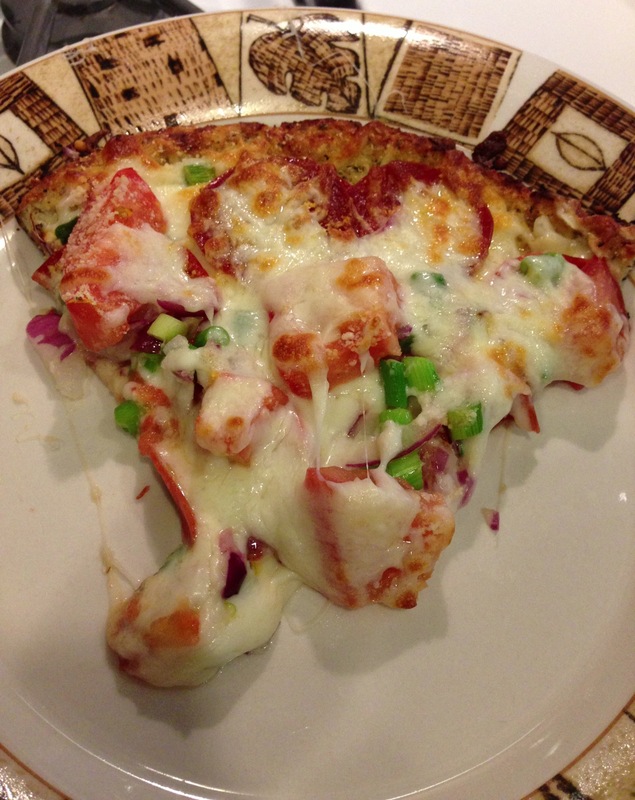 I felt having fewer ingredients helped bring out all the flavors more. Also, boiling the bell peppers longer in water helped soften them, which added to this dish’s flavor. On a side note, the stuffing obviously is enough for more than 3 bell peppers but that’s all I had on hand. I would guess this recipe could easily fill a dozen bell peppers total. 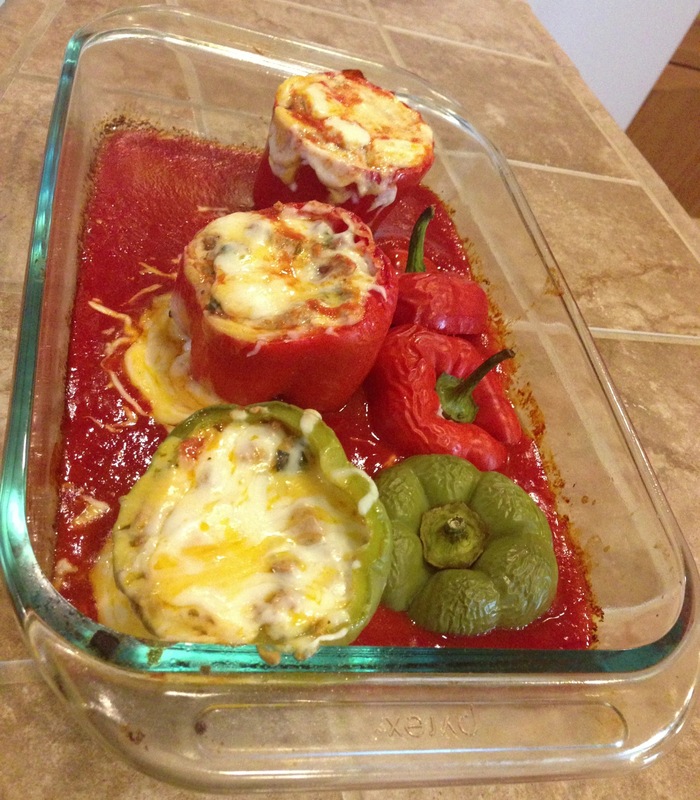 These stuffed bell peppers are ooey, gooey, cheesy, and delicious! I will definitely be making them more often in the future. I hope you try your hands at them. If you do, be sure to let me know how they turn out. Being on the SCD can be tough for many, since you inevitably miss a lot of the old foods you used to be able to eat. Luckily, we live in a time where Google exists, so finding a proper substitution for your favorite foods is just a few clicks away! 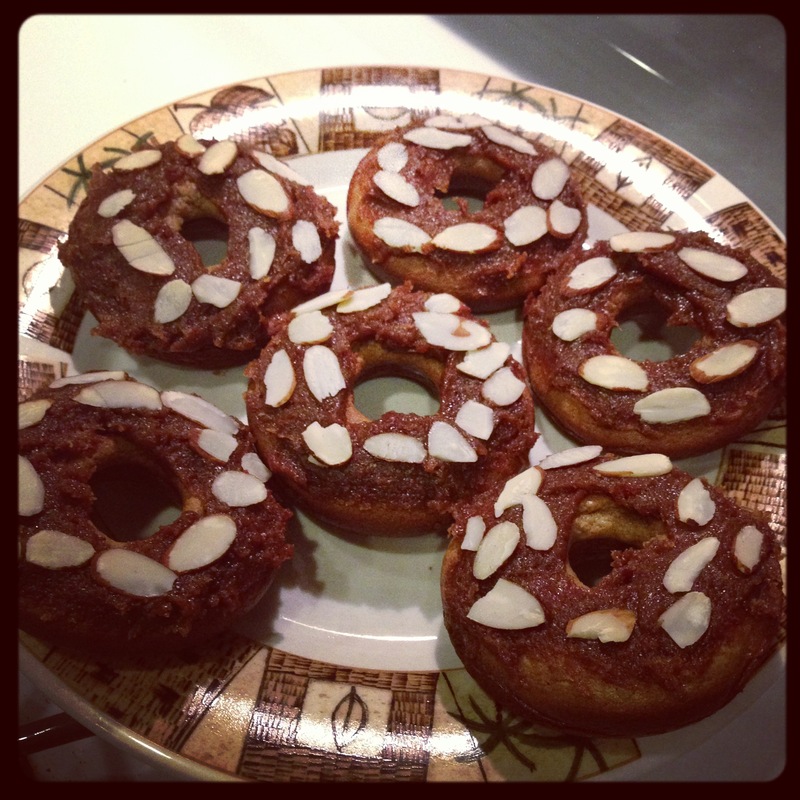 The other week I found a grain-free donut recipe. I wasn’t sure how the consistency of the donuts would be but to my surprise, the donuts turned out very moist and fluffy! They also taste divine! The “frosting,” which is made up of food processed dates, raisins, peanut butter, vanilla, cinnamon, and coconut oil, is so out-of-this-world delicious. I never knew food processing ingredients like that together could come anywhere close to resembling and tasting like real frosting. I almost followed the recipe to a tee; the only substitution I made was swapping out the almond butter for peanut butter, since I didn’t have almond butter on hand. My fear before making these was that they would taste too much like almonds because of the almond flour base. But, I think what really masks the almond flour taste is the addition of cinnamon, coconut oil, and nutmeg! Also, for the frosting ingredients, I would strongly recommend using the coconut oil, though the author of the recipe mentions that she might leave that out next time she makes them. The addition of the coconut oil ensures your frosting is as smooth as possible and easily spreads onto your donuts. Word to the wise, don’t try to spread your frosting on while your donuts are piping hot or else you’ll ruin your donuts. Wait about 2-3 minutes, so that they’re still a little warm, and then, spread your frosting. These donuts are so good that words can’t even describe them! Try them for yourself. They definitely make me not miss the traditional sugar-laden donuts.